Last last year Arab Shipbuilding and Repair Yard (ASRY) appointed Nils Kristian Berge acting Chief Executive to succeed Chris Potter. 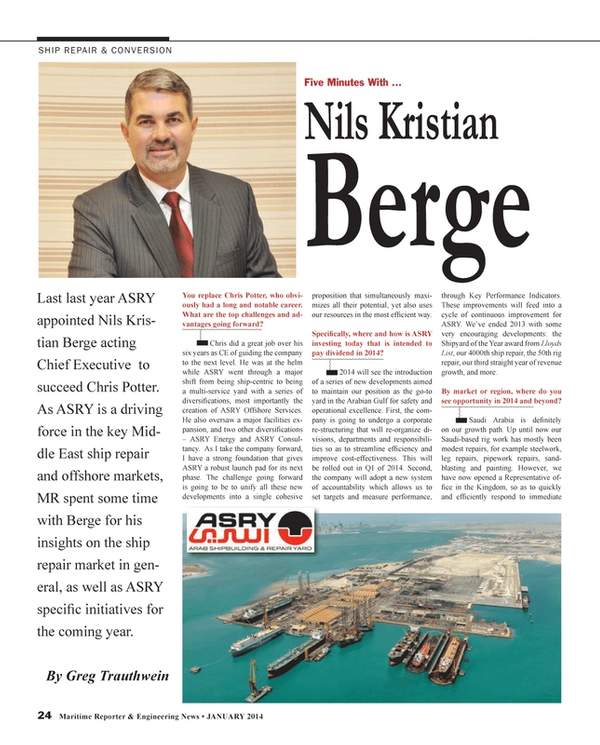 As ASRY is a driving force in the key Middle East ship repair and offshore markets, Maritime Reporter spent some time with Berge for his insights on the ship repair market in general, as well as ASRY specific initiatives for the coming year. You replace Chris Potter, who obviously had a long and notable career. What are the top challenges and advantages going forward? Chris did a great job over his six years as CE of guiding the company to the next level. He was at the helm while ASRY went through a major shift from being ship-centric to being a multi-service yard with a series of diversifications, most importantly the creation of ASRY Offshore Services. He also oversaw a major facilities expansion, and two other diversifications – ASRY Energy and ASRY Consultancy. As I take the company forward, I have a strong foundation that gives ASRY a robust launch pad for its next phase. The challenge going forward is going to be to unify all these new developments into a single cohesive proposition that simultaneously maximizes all their potential, yet also uses our resources in the most efficient way. Specifically, where and how is ASRY investing today that is intended to pay dividend in 2014? 2014 will see the introduction of a series of new developments aimed to maintain our position as the go-to yard in the Arabian Gulf for safety and operational excellence. First, the company is going to undergo a corporate restructuring that will reorganize divisions, departments and responsibilities so as to streamline efficiency and improve cost-effectiveness. This will be rolled out in Q1 of 2014. Second, the company will adopt a new system of accountability which allows us to set targets and measure performance, through Key Performance Indicators. These improvements will feed into a cycle of continuous improvement for ASRY. We’ve ended 2013 with some very encouraging developments: the Shipyard of the Year award from Lloyds List, our 4,000th ship repair, the 50th rig repair, our third straight year of revenue growth, and more. By market or region, where do you see opportunity in 2014 and beyond? Saudi Arabia is definitely on our growth path. Up until now our Saudi-based rig work has mostly been modest repairs, for example steelwork, leg repairs, pipework repairs, sandblasting and painting. However, we have now opened a Representative office in the Kingdom, so as to quickly and efficiently respond to immediate repair requirements in Saudi, with major rig repairs still being carried out in our Bahrain facility. The ability to respond with more efficiency is just one of the advantages of having a branch in Saudi Arabia, another advantage being the greater variety of jobs the yard will be exposed to. For example, ASRY has been contracted to install fiber optic cables for a client in Saudi on its offshore rigs, which was an interesting departure from regular repair jobs. ASRY will start with minor repairs and services in Saudi Arabia with all the larger repairs being covered by its Bahrain facility. By product, where do you see opportunities for ASRY in the next few years. New projects from Saudi Arabia will likely include land rig work, with that being a growth area for the Kingdom, and we are also looking at small sized new build projects in the region. We have already constructed a fleet of workboats and will be targeted this market more aggressively in 2014. The Floating Power Plants market will continued to be focused on, as we have built two barges for an ASRY-Centrax joint venture product, and are in late stage talks for new contracts. Naturally the new regulations for BWTS and Emissions will gradually become more prevalent in our portfolio, and I expect a significant increase in retrofits of fuel treatment systems in the not too distant future. When you look at the changing shape of repair in the Gulf region, how do you see ASRY’s position in what is becoming a crowded marketplace? ASRY has three unique qualities that separate it from regional yards. First it has the greatest depth of experience in the region having been operational since 1977. Second our variety of facilities from drydock to floating docks, to slipways, to over 4 km of alongside berth space gives our customers flexibility and choice. We can service any kind of vessel, but more importantly we can service many different types simultaneously. Third, ASRY is very lucky to be located in Bahrain, not just for its prime geographical location, but because of the country’s business-friendly policies. Customers are constantly pleased by the speed at which we can import both spare parts and labour to get jobs done ahead of schedule. When days and hours are vital to cost-reduction for our clients, other Middle East countries can get expensive, but Bahrain has the most advanced setup for ensuring quick turnarounds. ASRY has also built up a portfolio of in-house specialist contractors capable of servicing all aspects of the repairs, which is unique in the Middle East, and creates a One stop shop” effect for customers using the yard. Can you discuss your outlook for the care and maintenance of U.S. Navy ships (and for that matter, U.S. cargo ships) operating in your region? We have a very good relationship with the U.S. Navy, and continue to assist with the fleet maintenance on a regular basis. We are also supporting the other Navy’s present in the region which has allowed ASRY to become well established in meeting Navy requirements. This has been an area of growth recently and we expect further positive development. Also, U.S.-Flagged merchant ships as well as U.S.-operated ships are regularly repaired at ASRY and this will continue to be an important market.